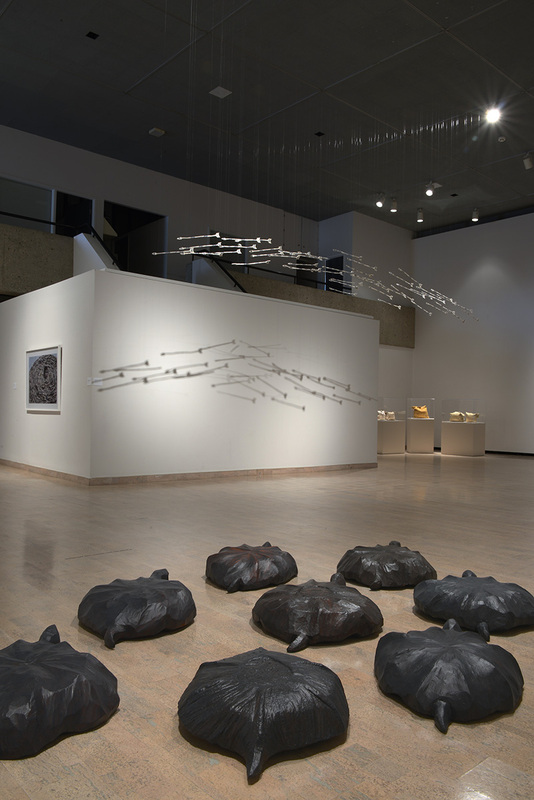 Installation view of The Fifth World at the Mendel Art Gallery, Saskatoon, April 3−June 7, 2015. 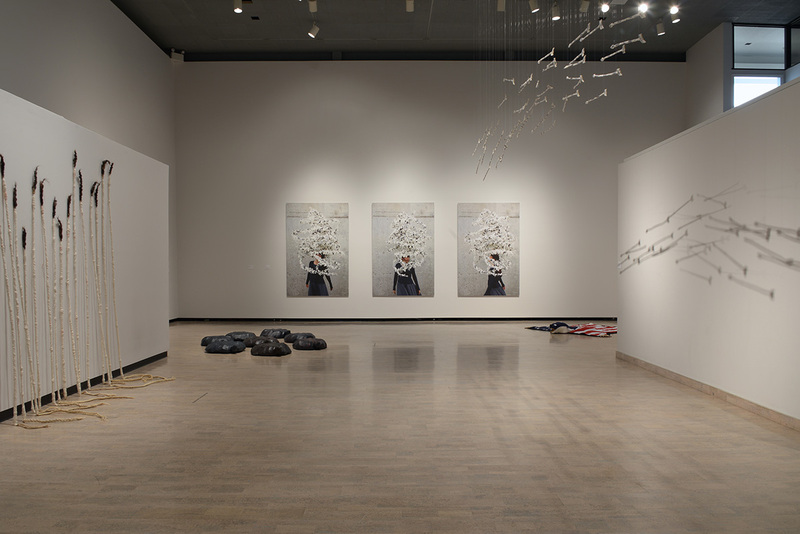 Installation view of The Fifth World at the Mendel Art Gallery, Saskatoon, April 3−June 7, 2015. 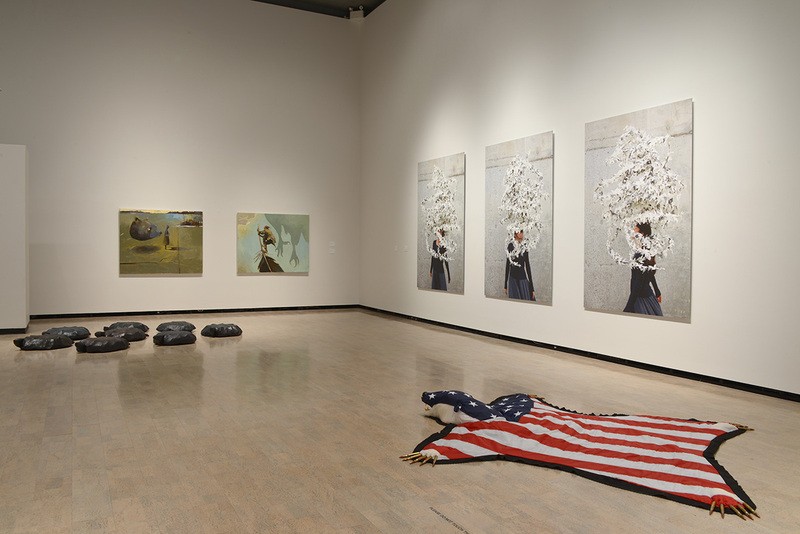 Installation view of The Fifth World at the Mendel Art Gallery, Saskatoon, April 3−June 7, 2015. 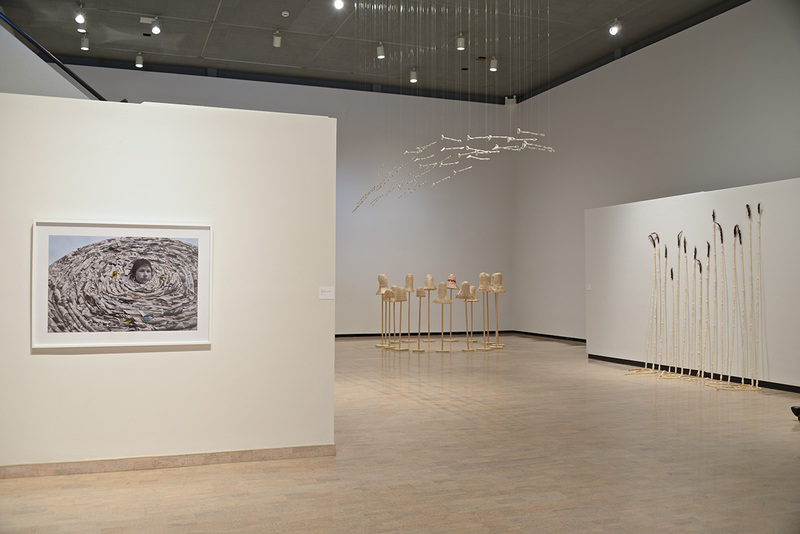 Installation view of The Fifth World at the Mendel Art Gallery, Saskatoon, April 3−June 7, 2015. Nicholas Galanin: The American Dream is Alive and Well (2012). Installation view in The Fifth World at the Mendel Art Gallery, Saskatoon. The Fifth World is the final exhibition at the Mendel Art Gallery before it closes its doors in preparation for the opening of the Remai Modern, as well as the first in a series of events and exhibitions marking the twentieth anniversary of TRIBE, Inc., a centre for evolving Aboriginal media, visual and performing arts. 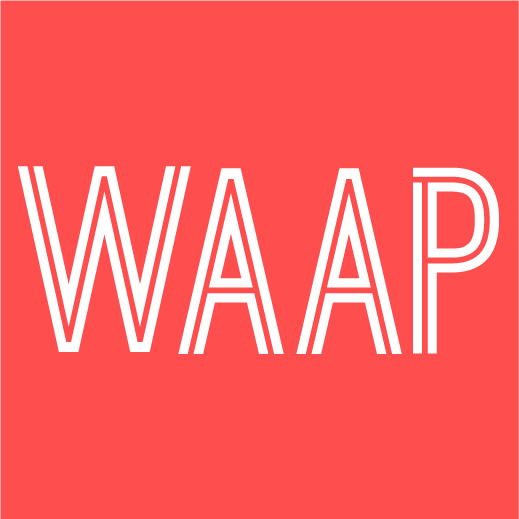 As such, it inhabits a special conceptual space in the social, cultural and political narrative of Saskatoon. Collecting a loose framework of younger Indigenous artists and others new to the prairies, curator Wanda Nanibush emphasizes “that the show [being] political is a given, as art is inseparable from these struggles.” Many of the artists here express what Steve Loft has called “an aesthetics of resistance.” Sometimes it’s overt, as with Nicholas Galanin’s The American Dream is Alive and Well (2012). 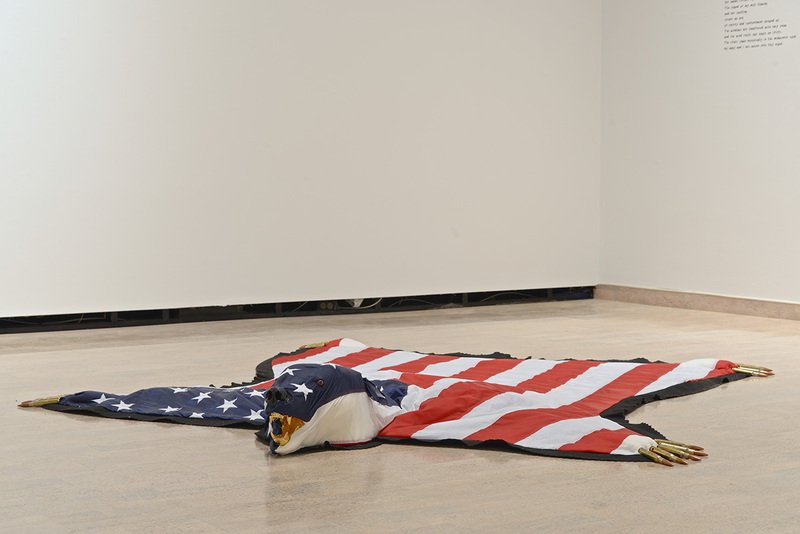 This sculpture, formally referencing a bearskin rug, appropriates an American flag as the pelt, with massive, shining gold teeth and claws made of .50 caliber bullets. Nanibush comments that the work alludes to the Hotchkiss Mountain guns that massacred Indigenous fighters at Wounded Knee in 1890, which intersects with the struggles cited by Skeena Reese’s Transmissions from the Raven: On the Colonial Fleet (2015). A video projection that mixes footage old and new of various sites and acts of resistance to past and present colonialism, it took on even greater relevance when, in the gallery, I encountered a teacher and students enraptured by the work. The instructor was expounding on Oka, Idle No More and many other external factors that play so strongly in the works of The Fifth World. Considering the often-tense history of this place, whether Starlight Tours or the allegations of institutional racism at the University of Saskatchewan Art Department, these students engaging with Transmissions from the Raven illustrate the change that TRIBE, Inc. has fostered. The fragile beauty of Galanin’s I Dreamt I Could Fly (2013) is confounded by the knowledge that the ceramic arrows, delicately patterned in blue on white, would shatter if their arc of flight were completed by hitting the wall. Hanging above our heads, out of reach, the forty-eight shafts, in the words of Nanibush, encapsulate the frustration and uselessness of the intentionally stuttered and ineffectual “conversation” between Indigenous peoples and settlers that have become the norm. Alternately, Charlene Vickers’ Turtles (2012), with abstracted but life-sized “animals” in a bale, seemingly about to trek across the gallery floor, evokes the role of these animals as guides in the Anishinaabe tradition. Her Diviners (2012), wound together from grass, fibre, hair and twine droop downwards like the divining rods they mimic, perpetually searching. Whether they seek The Fifth World, or one better than our current one, is unclear. With other works, the politics are more subtle: Meryl McMaster’s digital print Aphoristic Currents (2013) requires a more attentive reading to see the headlines and news stories that are in the vortex of shredded newspapers. This refinement doesn’t preclude that McMaster seems in danger of drowning in this eddy, with an allusion to violence that equals Galanin’s more direct imagery. According to Nanibush, The Fifth World suggests “the Hopi prophecy of an impending choice between violence and destruction or thinking with our hearts in harmony with nature.” Jordan Bennett’s Artifact Bags (2013) are beautiful indictments of how consumerism is fetishized in Western colonial culture, consuming all in its maw, whether natural resources or societies that can be repackaged and resold. These are both reminiscent of the debate around the glut of “disposable” plastic bags or how commodity intrudes even into a space of culture. Crafted out of elk, moose, and deer hide and emblazoned with the almost offensive logos of Giant Tiger or The Bay, these are truly artifacts of the colonialist state that is Canada. The Fifth World is an exhibition that’s very beautiful in execution, and strident in content. When considering the history of Saskatoon and the legacy of Prairie Modernism, the statement that’s made by closing the Mendel with a show of politically challenging contemporary Indigenous artists is monumental.